All season, the Mets have been in search of a “stopper” — a bonafide, ace-like starter who can put an end to losing streaks, and reverse negative momentum. With his performance last night, John Maine put the mantle on his shoulders; he is unequivocally the Mets’ “stopper”. Oh, and a note to anyone not wearing a Mets uniform: don’t get this guy mad. The Mets — as they’ve been doing all year — got on the board right away with two runs in the first, thanks to a Jose Reyes triple and RBI singles by Ricky Ledee and Carlos Delgado. They tacked on three more as the game went on, and Maine took care of the rest, going 7 2/3 innings, allowing two walks, six hits, two runs, and struck out a career-high nine. Though he has continually downplayed it, and insisted that he doesn’t think about it, you really must wonder if the snubbing of John Maine from the All-Star team had something to do with the dominating performance he displayed in this game. More than likely, the selection of Roy Oswalt to replace John Smoltz for the All-Star team was the furthest thing from his mind. But that doesn’t make for a good story. So we’ll pretend. John Maine, fired up about being passed over for the NL All-Star team, decided to show the fans and the National League what they’d be missing next Tuesday. And it was all the sweeter to do it in front of Roy Oswalt, who had just been named as the substitute for the injured John Smoltz. Despite outpitching Oswalt in every category — and being fourth in the NL in ERA — Maine was passed over by Tony LaRussa twice, by the players, and by the person responsible for creating the “Final Vote” ballot for the fans. Maine’s response to this universal disrespect was to pitch his most intense and spectacular game of the year. By the end of the third inning, Maine had already struck out seven batters, prompting SNY to pose the question of whether striking out 20 batters in a game was the most difficult thing to do in baseball. He was cruising, getting swings and misses, mis-hits, and harmless fly balls. Particularly inspiring was his ownership of the inside part of the plate, and the occasional “shaves” he gave batters on 0-2 counts. 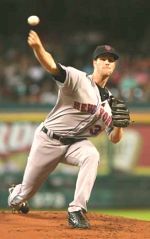 It’s been a long time since we’ve seen a Mets pitcher buzz up and in with purpose, gusto and bravado — a refreshing change from the typical “keep it outside” nibble and pick approach. The defining moment of the game for Maine came in the sixth, when Craig Biggio led off with a basehit and Hunter Spence reached on routine fly that Ricky Ledee misplayed into a single. With none out, the meat of the Astros order was up — Lance Berkman, Carlos Lee, and Mark Loretta (the Killer L’s ?). Maine struck out Berkman and Lee and disposed of Loretta via an easy popup to end the threat and the inning. He then breezed through the seventh without incident, but in the eighth, Biggio again led off with a hit — a ground-rule double. Maine stayed on to retire the next two batters, but then allowed a double to Lee that chased Biggio home and Maine to the dugout. Joe Smith came on and allowed a Texas Leaguer to right that scored Lee, and Pedro Feliciano was quickly brought in to strike out pinch-hitter Morgan Ensberg and finish the inning. Billy Wagner came on in the ninth and made fairly quick work of the ‘stros in a non-save situation. Ricky Ledee batted second in the lineup and played leftfield in the absence of Carlos Gomez (who is on the DL with a broken hand) and had a walk, two RBI singles, and a stolen base. While this was a wonderful performance from the perspective of the Mets fan, it was absolutely awful in that Willie Randolph will continue to believe in the Torre-like, nonsensical “hunches” that spill out of his brain. Yeah, Willie, that was a great hunch, you’re just absolutely brilliant. Now how many of your other “hunches” didn’t pan out before this one hit? His hunches are like the prophecies of Nostradamus. The famous “seer” made over 6000 predictions — so of course a dozen or so were bound to come true! Ramon Castro continues to pound the ball when given an opportunity to play. He had three hits — all hard-hit balls — and is now batting nearly .300 for the year. Carlos Delgado hit a single to right in the first, a 436-foot double off the centerfield wall in the third, a hard liner to center in the fifth, walked in the seventh, then fell behind 0-2 in the ninth before fouling off several pitches and eventually sending a solid line drive into center for his fourth hit of the game. We haven’t seen Delgado let the ball get this deep and trust his hands with this kind of confidence since 2006 — is the giant finally awake? Did someone mention before the Colorado series that Shawn Green was getting good at-bats lately, and might break out of his slump? Oh, yeah, that was me. Since I made that point, he’s been 6-for-16 (.375) with three doubles. OK, so he’s not exactly on a “tear”, but it’s a pretty nice clip. And while we’re speaking of good at-bats, Carlos Beltran hadn’t been getting many lately — it seemed as though he’d grounded out to first base about a hundred times in the last four games. He finally went the other way with one, and wow, it went over the leftfield fence. Huh. Magically, John Maine began to tire immediately after pitch number 99. It would be nice if pitchers would be pushed toward 120 – 130 tosses every once in a while, so that they’d be in shape to continue throwing with effectiveness beyond the century mark when necessary and appropriate. Many thanks to the SNY camera crew for showing us the bare feet of Keith Hernandez. Good thing Smell-O-Vision never took off. Why is Jose Valentin still in the game in the bottom of the ninth, with a four-run lead? There’s this kid named Gotay who plays the same position — some think with more effectiveness — who can give Valentin’s cranky knee a rest in the late innings. Mike Pelfrey gets a second chance in his second go-around with the big club, as the Astros send the immortal Wandy Rodriguez to the mound in another 8:05 PM EST start. There’s an outside shot we’ll see Sandy Alomar, Jr. catch, as he was Pelfrey’s caddy in the minors. Yeah, I wouldn’t want to be at the plate against a pissed-off John Maine. I was kinda caught up in the fact that he had seven of those nine strikeouts in the first three innings! His slider was absolutely filthy-deadly, and that riding fastball was improving on the shaves of several Astros. I think that having Sandy Alomar, Jr., catch tonight would be a great move. If Pelf could win with him at N’awlins, he can make one heluva difference catching Pelf in Houston. Generally I’m against a pitcher having a personal catcher (see what it did to Tim McCarver’s ego), but in Pelfrey’s case I think the Mets need to do whatever they can to get him a win. Going 0-7 on a first-place team does not bode well for a 23-year-old’s confidence. Maine: I am GLAD he was not picked. I wish DW, Beltran and Reyes would sit out too. They need the rest something awfull. Beltran: That was a HR? His legs did not move he did not stride into the ball, more a flick of the wrist ona ball in just the right spot. Delgado: Now that made me happy. He too has shown wear. Anyone who has had a newborn at home knows your rest factor gets shot in the head. His defense has taken a hit. But that 4-4 showed alot. The highest paid Met stepped up and LED. Castro/LoDuca: AGAIN, Castro is the better defensive catcher: How much of that Maine show was Castro? He knew what pitch to call!!! That was no more evident (to me) than in the Feliciano SO in which he set up Ensberg badly and Bithen Wags SO to end the game. castro might again be the difference tonight. NO. I disagree with personal catchers (although 2 years ago Glavine all but asked for Castro to be his), but Castro has earned a platoon……He might not be mouthy but his play calling and power have ALOT more to say. ..as does his $4M lesser salary!! When Castro was signed, he was available because of off field issues…now the off field issues are on LoDyuca. Lastings: 4-4, 2 doubles/one HR. Nuff said. Sele can be optioned? But I think Rohern should get a minor league contract. I’d also send Joe Smith down for 2 weeks for rest and call up Humber. Vargas is worthy of a look in Shoenweiss’ or Sele’s role. Mets Geek has a neat article on the roster. I’m not sure what Willie has against bench guys that do well (i.e., Castro, Gotay). After doing a nice job of keeping LoDuca fresh for most of the second half in 2006, he bulldozes him out there for nearly every inning of every game in the first half — despite having a very able Castro on the bench. It’s baffling, to say the least, because the Mets don’t lose anything offensively nor defensively when Ramon is behind the plate. I think Sele gets the boot — let him walk on with the Phillies or Cardinals. Personally, I’d keep Humber down for most of the rest of the season, maybe a start in September, and then have him hungry and ready for a shot at the 2008 rotation. They have mishandled Pelfrey from the get-go, and don’t want to see them rush Humber as well. I hope Willie is better in august. The problem is the Roster is becoming inflexible. I suspect Sho or Mota could be included in the Buerle (or like ) trade. RANT: Many bloggers have said they are happy with the rotation. ???? ?%%%** Many of these bloggers werte happy with Traxx, and El Duque and advocated sitting Ollie until Spring and having Maine work out of the pen in last yrs NLCS. Well that was before old age caught up with EL duque before his start..guess what a star was born in John Maine who most days looks alot like one Roy Oswalt. Also Ollie stepped in Traxx’s shoes and made us forget Kazmir who the media in sedate Tampa are now turning on…they see what the media saw prior to his being traded away. I will revisit THAT later. JOE: Pelfrey was considered a bonafide stud before the draft. I cant disagree. BUT i think he might be more Bonderman than Verlander: ie needing time to develop. I am a minority but I would swap Pelfrey (and Sho & Ben Johnson) to CWS for Javy Vazquez. Then put Humber in the pen with El Duque. Again I am the minority, but El Duque is fragile and his age undermines him. He might be the second coming of Satchel Paige but he has limits. I’d keep him fresh in the pen as a 6th starter and bring him out in the stretch run. Our bullpen is short because no one can work long stretches. There is no Turk, no Weathers, no Oliver. I think Humber can imitate Heilman (better) and he needs to see ML pitching. I think he would develop out of the pen and then compete for the rotation next yr. I think He also can be that 2 inning guy that Mota cannot. Humber is comiing of Arm surgery. He needs a pitch count and some limits. IF he has velocity back and his secondary pitches are OK, time with Rick daily now might be good. PLUS this plan represents a departure from the Pelfrey plan. I’m with you on the rotation. Glavine is atrocious if the ump doesn’t give him a liberal strike zone, El Duque as you said is fragile, who knows what’s up with Ollie, and even if Sosa can come back from the hammy pull, I’m still not convinced anyone throwing 75% sliders can survive as a starter. I’m completely in agreement re: the Pelfrey-Bonderman comparison — there’s no doubt in my mind Pelf needs at least TWO more years before doing something special. Can NY wait? Likely not. Vazquez is an interesting alternative, as he’d likely benefit from a return to the NL and will be a solid innings-eater the next two years. Humber in a relief role, I like — especially seeing how Wainwright did in St. Looie last year. As long as they don’t do to him what they did to Grant Roberts and Heilman (leaving a starter in the pen). I still think Roberts would have been a top-of-the-rotation guy had the Mets not jerked him back and forth (starting and relieving) — that had to be the reason for his multiple arm issues (the pot smoking is another story). Glavine is a difficult issue. You have to just let him fade out with his 303 wins. But I think Pedro could be activated Aug30th but only as insurance. I think NEXT year is for Pedro. I would be suprised to see him. To review the outfield these are our assets; Alou, Gomez, Milledge, Negron, ambres, Ben Johnson, Green Endy and Beltran. Oh and Rickey…Ledee not Henderson. Isnt that enuff? Why would you want Podsednik or a broken jermaine Dye? The outfield problem is WILLIE. he cant rotate players. as I have said before (mets Geek is off too but close) milledge and Green in RF, beltran in CF Alou in LF. Endy rotates at all 3 OF spots, Lastings flunked LF last yr. He IS a CF with RF as his next home. I’d rotate Green in at 1st too. beltran needs a break . we dont need a closer. We have a r-L set up combo (Heilman/feliciano), we have a 7th inning combo-mota WE NEED A LONG MAN; the 4th/5th/6th inning guy. that is NOT Ostuka, not Gagne, not Linebrink. IT could be dave Williams or Sosa. Willie “goes with his guys” and that’s about the extent of his science. After hearing him on WFAN this afternoon I’m really convinced he’s an idiot when it comes to player management. Hmm … and his in-game strategy management is borderline buffoonery … what IS it that keeps him employed? Oh, that’s right — great pitching and three-run homers (oh wait, that was Earl Weaver). Do you really think we need a long man? Sele didn’t pitch for about two weeks.